Guide bees. Can we use honey bees and beehives as guidelines on how to create change through community? A neophytes experience. Last summer I did some work with bees in co-creating office art. 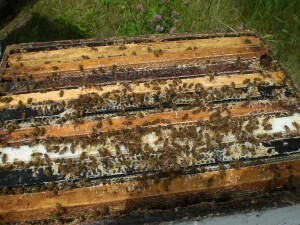 This summer I hope to place a few networked computers into the hive to create parallel play with honey bees. I believe there is much to be learned about social community from bees as we learn more about honey bees. I do have the image of this working like a hive without formal leadership, creating community buzz, finding engaging “honey”, doing “waggle dances” to signal others, various people having various roles, and all of it being voluntary — done with our cognitive surplus. There are some members that want a more formal organization and I would support that but not house that in the community. There are some that want standards which I may support but I do not want to do it. This will not become an institute or organization in the formal sense, at least as I see it. Yet I know that 50% of the time I am wrong. I will be going into the bee hives again this summer looking for lessons on how a community can foster something of such a big scale without exercising command and control and without formalizing too much while giving freedom and encouragement for individuals and organizations to work in the ways that make sense to them. All this while gathering data and resources to help make changes. Honey bees will cook the queen if she isn’t working and I could get cooked with this project but but it is so cold in Winnipeg that getting cooked sounds warm to me. I have inserted two of my bee picture above. The picture with the glasses are wasps dropping by later to clean a piece of work glasses to symbolize the joining of the 20% vision with lessons from bees. This post was originally generated as a response to Craig Althof on the Employee Engagement Network.